A temporary adhesive. These wash away adhesives are used as a temporary bond for holding delicate crystals, metallurgical specimens, glass components, and ceramic substrates for dicing, slicing, drilling and polishing. These materials adhere readily to metals, glass, ceramic and then can be washed after machining away using various solvents. 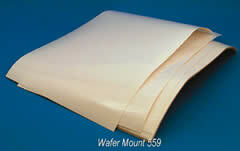 The same as 509 but used in applications where it is desirable to have a temporary bond which is water soluble. Each stick weighs about 90 grams. The same as 509 but offers maximum adhesion to subminiature parts. Each stick weighs about 225 grams. Available in sheet form 10"x10" (254x254mm). To use, remove the paper backing exposing the adhesive layer. The substrate is positioned on the film and pressed down firmly so that it adheres to the plastic film. No heating is required. The wafer mounted on the plastic film can then be held down using a vacuum manifold or mechanical means for dicing or scribing. After dicing or scribing, the parts can be separated from the wafer-mount 559 film by washing in acetone or MEK. Ideal for holding down silicon wafers, alumina, or glass substrates for scribing. A dry temporary adhesive film, 0.003" thick, which can be easily cut to size with either a razor or scissor. This mount permits pre-placement of the adhesive film exactly where the user wants it. It melts at 195-210°F. After application it can be dissolved rapidly in trichloroethylene or toluene. This material is particularly useful in applications where a pre-formed adhesive film is needed to assure uniform bonding and flatness or in bonding stacks of substrates such as LCD glass slides for slicing. Sheet size 8" x 10".